Welcome to a new series on making drum charts. Most gigging professional drummers have their own system. Mine is still developing, but I’ve got enough of a handle on it that I want to start sharing some ideas with you. The plan is to show you examples of drum chart/cheat sheets that I use in real life for playing shows or recording sessions. This week I have a show with Lilli Passero, an amazing singer who you might have seen on “The Voice.” One of her songs, called “Did Ya Know,” which we’re playing at the upcoming show, has a lot of spots where the drums stop playing. In fact, there are four different places in the song where the drums drop out, and each time it’s for a different length of time. I had tried to memorize the song before our first rehearsal. Unfortunately, I was not successful! For me, playing this tune in rehearsal sucked because I didn’t have the arrangement locked down. That made me uncomfortable. That discomfort was making my playing sound tentative. And of course that would be the case, right? If I’m not comfortable that I know the arrangement of the song well enough, then I’m going to feel anxious and feeling anxious shows in one’s playing. The idea is to know the arrangement really well (or to have a solid, correct chart) so that you can concentrate on making your playing top-notch. I decided to make a chart so I would nail the song at the gig. Let’s discuss the chart. I start with the name of the song, nice and big. Yikes! This time I got that wrong. The song is “Did Ya Know,” not “Do Ya Know.” Ok, now I know! But for the gig, the mistake doesn’t really matter. Next, what is the tempo? In case I am called upon to count off the tune, the metronome marking is nice and big in the upper right hand corner: 90 bpm. Next, I want to know how the song starts. Do the drums come in right away? If I’m learning a bunch of songs quickly and I can’t think of the tune in my head while I’m on stage during the performance (which sometimes happens) I know all will be OK if I know 1) where I come in and 2) the groove I have to play. In this case, you’ll see my note: “GTR/VOCALS START.” There’s my answer. I don’t play at the beginning of the tune, the guitar (live the guitar replaces the keyboards of the recording on Spotify) and vocals start the tune. But, where do I come in? And what do I play? A ha! Well, that’s my next note. 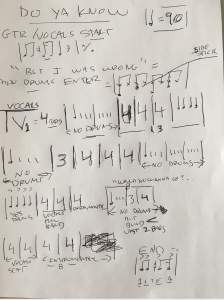 I have “But I was Wrong” written down and then a note that says THEN DRUMS ENTER. Next to that is the groove written out in rhythmic notation that gives me the basic idea of the beat I have to play. The note “But I Was Wrong” is telling me that I need to listen for that vocal cue from Lilli. When I hear those words, I know that I’m about to come in. I know from listening to the song that I come in one measure after I hear that lyric. What follows on my chart are four rows of notation that basically tell me when to play and when not to play, and a few accents that I should hit. I don’t usually chart out the entire song, but in this case I did because the drums drop out so many times and the arrangement is never the same twice when the drums drop out and come back in. I stop playing for two measures, eight measures, one measure…..etc… It would be really hard for anyone to remember that and learn it quickly, so my answer was to chart it all out, which didn’t really take that long… maybe a half hour? The big numbers (mostly “4”s) indicate how many bars of 4/4 are going by. It’s pretty easy to see from looking at the chart when I play and when I don’t. I just wrote NO DRUMS beneath the measures I don’t play. You’ll have to get good at counting the bars going by and still grooving hard. That is a skill that takes some practice. It takes real concentration. Practice it by playing along with this chart. Note that I made this chart from a rehearsal tape, but it lines up pretty well with how the recording on Spotify is arranged. The only thing wrong on my chart versus the recording is that the instrumental section noted at 4 bars in the third row of the chart is actually 8 bars on the recording. Besides that, you could play drums along with the studio version of the song on Spotify perfectly by looking at this chart. One last thing you need to know when you’re charting out songs: how does it end? You can see that I wrote the figure the band plays to end the song in the lower right hand corner of the chart. I’ll keep posting these as I make more for different gigs. I think they might be helpful.